Great price and quick delivery. I really love these tiles. The colour is amazing and so rich. These tiles are amongst the least expensive 300 x 600 tiles we have found. 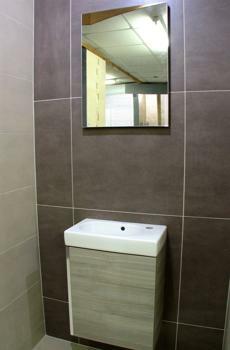 However the price does not indicate the quality - the tiles are excellent, relatively thin for their size at around 8mm, but they are strong and are really easy to work with and cut/drill/core etc for use in the most complex bathroom designs. As we live in a hard water area the semi-matt surface finish and stippled grey pattern is ideal for not showing water marks. We have used these on several properties we have refurbished now and they have not failed to please in any installation. Highly recommended. Product was delivered on time and at a competetive price. Great customer service keeping me informed on delivery. The roduct does exactly what it purports to. Excellent service and besides being very helpful had a full knowledge of the product. 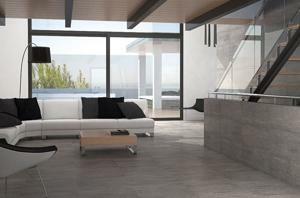 Large tiles, especially porcelain tiles can look stunning when fitted and are proving to be an increasingly popular choice. In general we find that our customers love the look but sometimes have concerns about the implications of choosing a such a large tile. This article aims to answer these questions, and point out just how beautiful large format tiles look in any area of your home. Using large format tiles in your room is a great way to achieve a simple, clean and less 'fussy' look. They introduce a grand, sophisticated feel to your room and really do look expensive. A common mistake is to assume that choosing large tiles means less work when it comes to fitting. In fact a large tile increases the need to prepare properly but this shouldn't put you off. Simply put - Flatness matters! Minor holes and imperfections don't matter but undulations do! To check hold a long spirit level or straight edge across the surface, if it rocks from side to side or you can see gaps under the edge of more than 5mm then some further prep will be needed. Check all across your surface and check from a variety of angles. Tiles don't bend and large tiles will reduce the ability to 'correct' using extra adhesive. Self leveling compound can be used to fix a bad surface. Suitably prepared, most surfaces can have large tiles fitted to them. Concrete, wooden floors, cement backer boards are all suitable. Plastered surfaces need a bit of extra thought, essentially all wall surfaces have a maximum weight that they can support, this is usually expressed as a maximum per m2. Gypsum plaster(skim) has the lowest value of all - just 20kg m2 and most large tiles are way above this value.Un-skimmed plasterboard can support 32kg m2 and cement backerboard is good for 50kg m2, so don't waste your time and money plastering areas that you intend to tile. Simple! choose a good quality powdered adhesive, preferably a polymer modified one such as granfix fastset flexible . To explain the advice above consider that in general, tile adhesive can be split into 2 types; ready mixed and powdered. Ready mixed adhesive may sound easiest but is actually totally unsuitable when fitting large tiles to a wall or floor because these adhesives need contact with air to dry and often fail in the middle of large tiles. In general select a powdered adhesive for any tile over 300x300mm. For porcelain tiles choose a single part, polymer modified adhesive. This is also suitable for ceramic tiles and is often only a few pence dearer than a plain old rapid set. To prime most surfaces simply prime with acrylic bonding agent*, and tile using a notched trowel. * dilutions vary, see bottle for details. Cutting very large tiles isn't really any harder, but you will need a cutter with a large enough bed to accommodate the tile. The Rubi TX range is perhaps the best available. Most tilers have this covered but if you are doing the job yourself ensure you are prepared for the cost of hiring or buying of this equipment. Ceramic tiles are easier to cut than porcelain, but with the right kit even large porcelain isn't too challenging. Always use a score and snap dry cutter for straight cuts and a water-cooled tile saw for shaped cuts. Do not be tempted to use the electric saw for all the cuts as its far too slow and usually results in a lower quality finish. The tiles featured in this post Fanal Product Gris and Nuvola Brown by Dura . For more options why not view our range of large format floor and wall tiles? Get the latest offers, trends and tips direct to your inbox. Trends, tips & more in our blog!